Based on twenty years of research and field experience, this book collects a vast amount of information into a handy reference for mechanical and civil engineers. It focuses on four basic elements of grouting: load carrying capability of the foundation soil; mass design, concrete mix and installation, and curing procedures of the foundation; anchor bolts; and the grout. 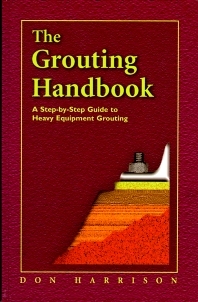 From the ground up, this book takes you step by step through the grouting process. Clear, straightforward directions give you details on preparing the foundation and surface, and selecting the best material and method. Comprehensive yet concise, this is a convenient handbook for veteran and rookie engineers alike.